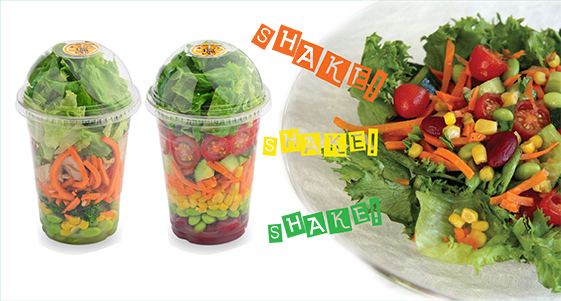 Two new summer salads were created by Nijiya! The wild rice salad uses some of very popular super food Wild Rice, Quinoa, lentil beans, red kidney bean, Edamame mixed with well-balanced fresh greens. Nijiya’s organic salted lemon dressing brings all the great flavor. 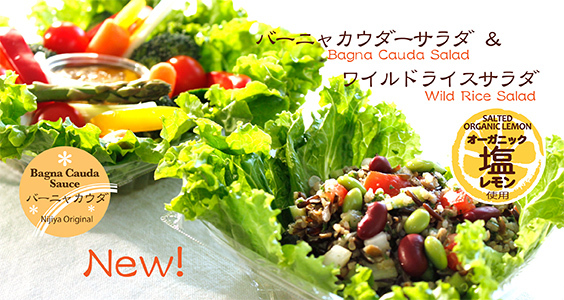 The Bagna Cauda salad comes with Nijiya’s original Bagna caudal dipping sauce typical of Piedmont Italy. The sauce is made with garlic, anchovies and olive oil and a great match for fresh stick vegetables. Enjoy healthy fresh summer salad! The seafood gyoza is made with fresh plump ship, squid meat, scallops and Alaska pollock. The juicy pork Gyoza has cabbage and green onions. We do not use any additives nor MSG. 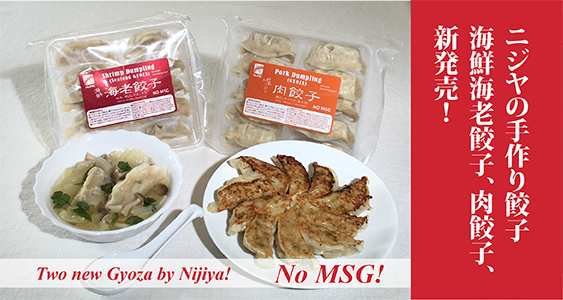 Enjoy these new Gyoza by Nijiya. 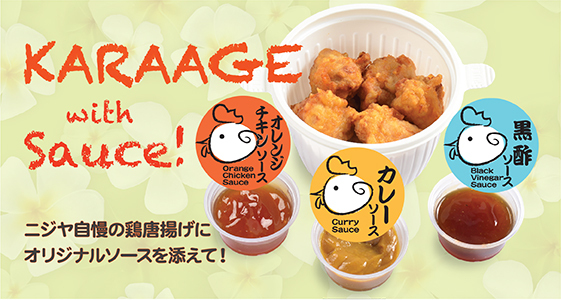 Nijiya’s popular chicken karaage now comes with a special sauce! Special sauces for the hot summer season. They are all exciting sauces great for dinner and parties to enjoy Karaage Chicken. ●Orange Chicken Sauce Nijiya’s original orange chicken sauce is light and healthy. This will make a great dish for a summer party. ●Black Vinegar Sauce Black vinegar became very popular for its health benefits. It is said to help recovering from heat fatigue. This is a great food for the summer. ●Curry Sauce It is a mild curry sauce made to match with Karaage Chicken. Curry spices are believed to enhance appetite even under a hot summer weather. A new drink [Purple sweet potato Amazake, it is good to drink cold] is here! This is a new variation of already popular [Sweet potato Amazake] introduced last year. This [Purple sweet potato Amazake] is made with Organic purple sweet potato harvested in Nijiya’s organic farm. The organic purple sweet potato is fermented by malted rice to enhance its natural sweetness and rich flavor with no additives. There is no alcohol and no sugar added so that even small children can enjoy the drink. The organic purple sweet potato Amazake is rich in Vitamin B, oligosaccharide, dextrose and dietary fiber. Olibosaccharide is known to increase the number of these beneficial bacteria in the colon while simultaneously reducing the population of harmful bacteria. And the color purple comes from Anthocyanin which act as powerful antioxidants and known to benefit maintaining eye sights and the liver. This new original Purple Sweet Potato Amazake by Nijiya taste even better with your favorite ice cream or yogurt toppoings. It is also good warm or use to make a soup. Start Amazake life with Nijiya’s Purple Sweet Potato Amazake for your beauty and health. Very popular topping of steamed rice, called Nametake, is usually added several kinds of thickeners. In short, you can hardly find the one without additives. Compared with other products, we never use thickeners and additives for “IRO IRO KINOKO TO KONBU NO NAMETAKE”. Instead of thickeners, we trust natural thickness from Mushrooms and Konbu Seaweed. 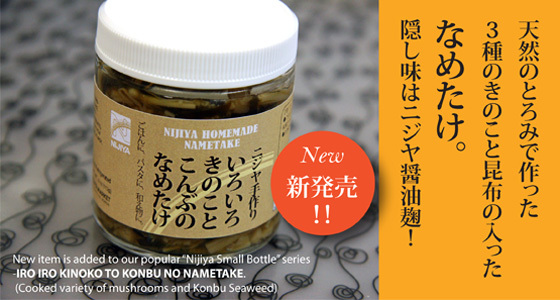 “IRO IRO KINOKO TO KONBU NO NAMETAKE” is made with three kinds of mushrooms (Enoki /Shiitake/Eringi mushrooms) and Konbu Seaweed. All ingredients are rich in minerals and fiber- Nutritious, and helps our healthy life. In addition, mushrooms and Konbu seaweed have natural UMAMI that is very popular ingredient of soup stock. Enjoy our wholesome product on steamed rice, use as an ingredient of Wafu Spaghetti, Soup, Wafu omelet, or toss with boiled vegetables. More than that, creating your own recipe with “IRO IRO KINOKO TO KONBU NO NAMETAKE” will be enjoyable. 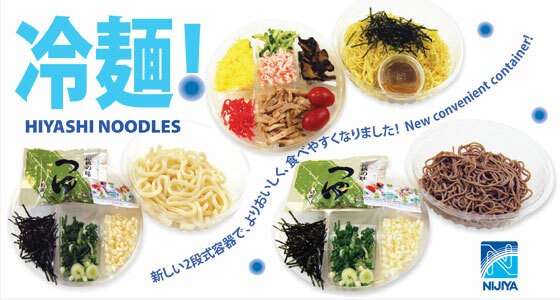 Even you are Ramen lover or not, Hiyashi Chuka (Cold Ramen) is very attractive in the hot season. This ideal meal in summer has smooth sensation when you swallowing, and helps supplying proteins, vitamins and minerals with plenty of toppings such as Cha-siu, imitation crab meat, egg, cucumbers, tomatoes, and shiitake mushrooms. Additionally, soup aside is Nijiiya Homemade – refreshing and a hint of sesame flavor. Of course no MSG is added. Combination with noodles and tempra or sushi is gorgeous and very popular. Compared with them, these items seem very simple. Since some people may consider the amount of carbohydrate and fat intake, these simple bowls obviously give advantages. 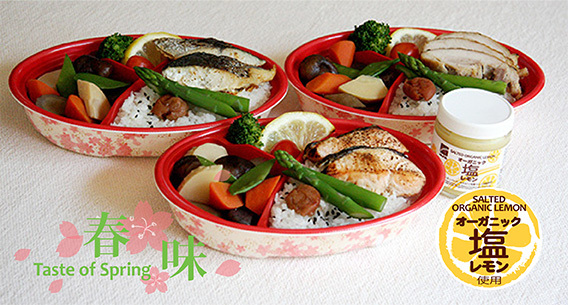 You can create your own combination with variety of Nijiya side dishes- cooked fish, meat and tofu items for protein intake, cooked vegetables or salad for vitamins and minerals intake. It will be fun to explore combinations with good nutrient balance. This is a very unique sushi that obviously you cannot find this kind of gorgeous rolls. There is chemistry between Sea Urchin and Squid. You can find the mixed one as a side dish of meal or a snack food with sake. 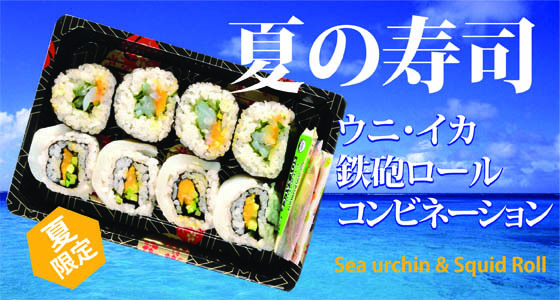 Nijiya proudly use Fresh Sea urchin and Squid separately and never use the mixed one. Therefore, you can enjoy Umami of each ingredient and then mixed taste. What makes it unique is that one kind of the rolls in this pack is rolled with Squid instead of Nori seaweed. Tastes marvelous! Please don’t miss our seasonal offer! 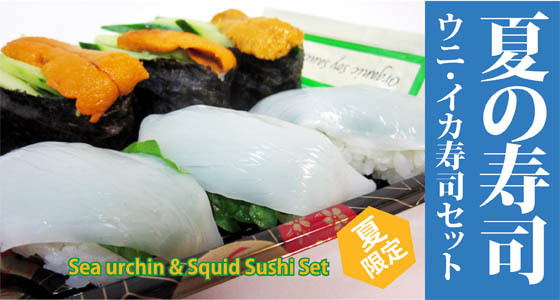 This is one of ideal sushi set – Sea Urchin Gunkan Sushi and Squid Nigiri Sushi. Sea Urchin is known as a king of Sushi ingredient. It is creamy and rich in taste and melts in the mouth. Cucumbers give you a refreshing sensation. Squid is a very popular ingredient for sushi- it has light and sweet taste and smooth texture. Combination with Ohba (Perrila: Seasonal Japanese herb in summer) brings you cool summer breeze.